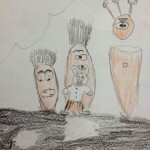 This week Division 2 tried a Visualization activity with the book Creepy Carrots by Aaron Reynolds. 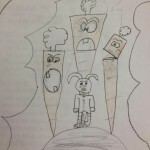 Ms. Lehnert described the picture on the cover, while students visualized in their minds and drew what Ms. Lehnert described. Students were not shown the picture until after the activity. Ms. Lehnert found it tricky to describe the picture as accurately as possible! 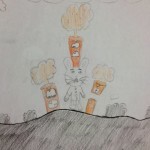 Here are a few completed drawings; they turned out quite well! 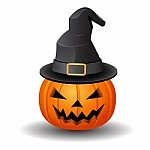 This week we will be reading Halloween-themed picture books. The Kindergarteners and Grade 1’s will be reading Pumpkin Cat by Anne Mortimer. Cat learns how to plant and grow pumpkins with Mouse. At the end of the story, Mouse has a surprise for Cat. 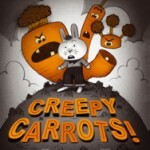 Grades 2 and up will be reading Creepy Carrots by Aaron Reynolds. 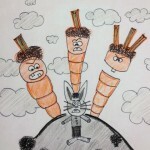 This is a hilarious story about some wild carrots who start to follow Jasper Rabbit around, because he is eating them. 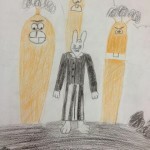 Do creepy carrots really exist? Find out this week!